Our 11-person team from Project Recover , along with four active-duty U.S. Navy Sailors, set sail on July 11, 2018, aboard the Research Vessel Norseman II to Kiska Island in the Aleutians to survey one of the most remote and austere underwater battlefield sites of World War II (WWII). Video from the discovery of the missing stern of the USS Abner Read. 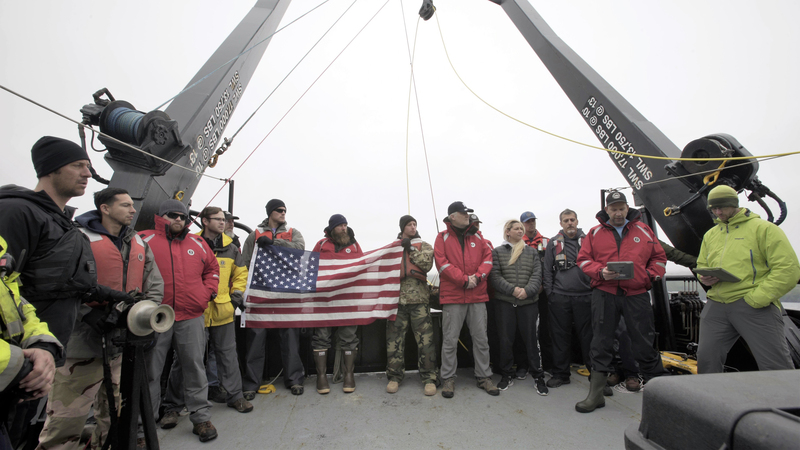 Video courtesy of the Kiska: Alaska's Underwater Battlefield expedition. Download larger version (mp4, 386 MB). For a complete shot list from the video, click here. Traveling to Kiska Island is no small feat, and required the team to catch the twice-a-week air flight to Adak Alaska, a former U.S. Navy base that was closed in the mid-90s at the end of the Cold War and now only resident to a few hundred hardy individuals. After arriving in Adak, a 250-nautical mile westerly transit across the unforgiving rough waters of the Bering Sea is required to reach Kiska. Adak is known as the ‘birthplace of the winds,’ and as part of the Aleutian Chain where the Bering Sea meets the Pacific Ocean, is known for high winds generally from the west throughout the year, thanks to the low pressure system known as the Aleutian low. The dive team deploying to investigate sonar targets collected via the REMUS 100 AUV, with the R/V Norseman II sailing in the background. Image courtesy of the Kiska: Alaska's Underwater Battlefield expedition. Download larger version (jpg, 5.7 MB). While a robust satellite link to our vessel provides contact to the outside world, the remoteness of the region can’t be understated, considering the nearest first-responders are at least four hours away by air-travel; assuming the weather is cooperating and allowing the long range U.S. Coast Guard helicopters to fly. Safety is a priority for every phase of the expedition, with daily briefs at breakfast for all onboard our research vessel to reinforce that safety is our first priority. Another way to put into context the remoteness of where we are working (for those who don’t routinely travel this far afield): the nearest Starbucks coffee shop is 1,400 nautical miles away in Anchorage, Alaska – that would be like traveling from my house in San Diego to Chicago for my morning Grande Dark Roast. 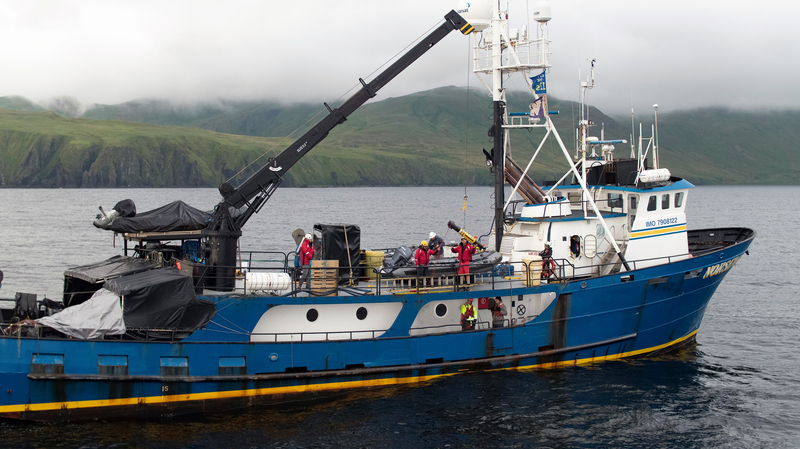 This expedition to the remote location of the Aleutian Islands would not have been possible without the support of the National Oceanic and Atmospheric Administration (NOAA) who is directly supporting the Kiska expedition, the Department of Defense – Office of Naval Research for their ongoing support of undersea technology, and the generous contributions from the Friedkin Foundation for supporting Project Recover to conduct U.S. Missing in Action (MIA) searches. While the academic objective of the expedition was to conduct a cultural resource survey of the Kiska Underwater Battlefield, this journey has shouldered the challenge of searching for, finding, and documenting the underwater reminders of the tragedy of war. Leveraging high technology and intelligence gleaned from declassified historical documents, Project Recover serves to find the proverbial ‘needle in a haystack’ so we can find sites associated with lost U.S. serviceman to recognize their service and provide closure to families whose loved ones paid the ultimate sacrifice for the freedoms we enjoy. Team member Matt Breece lowers the project ROV over the side of Research Vessel Norseman II. Image courtesy of Kiska: Alaska's Underwater Battlefield expedition. Download larger version (jpg, 2.4 MB). Team members launch one of the project’s four REMUS 100 autonomous underwater vehicles from R/V Norseman II for a survey of the seafloor. 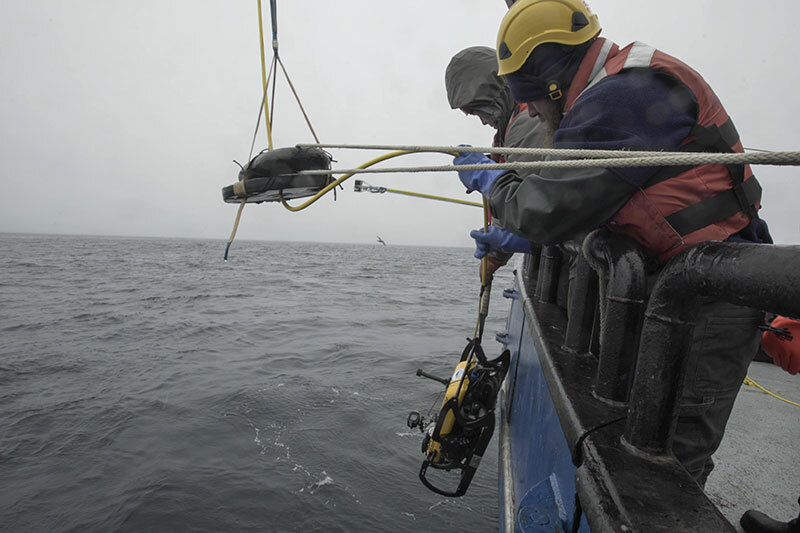 Image courtesy of Kiska: Alaska's Underwater Battlefield expedition. Download map (jpg, 8.0 MB). The searches on this expedition did not come without risk – the ocean is unforgiving on the best of days, and we were operating in waters where fog, wind, and cold temperatures in the low 40s are the norm. Fortunately, we had a team of some of the world’s best undersea engineers, analysts, marine scientists, technicians, and even an underwater forensic archeologist with several years’ experience as a civilian scientist at the Defense POW/MIA Accounting Agency (DPAA) to support the mission. At times I feel like I’m sailing with a combination of a NASA rocket scientists, NASCAR pit crew, surgeons, and the Delta Tau Chi fraternity brothers (Animal House reference…). The expertise and levity was needed for this trip, as this was one of the largest expeditions for Project Recover, with goals of documenting over 30 square kilometers underwater, searching for 10 U.S. aircraft, and an approximately 75-foot section of the destroyer USS Abner Read – in total the losses are associated with 117 U.S. Missing in Action whose remains have never been accounted for. We were also searching for several Japanese war losses as we documented this forgotten battlefield, including several submarines, knowing our countries are bound by war losses of young men. 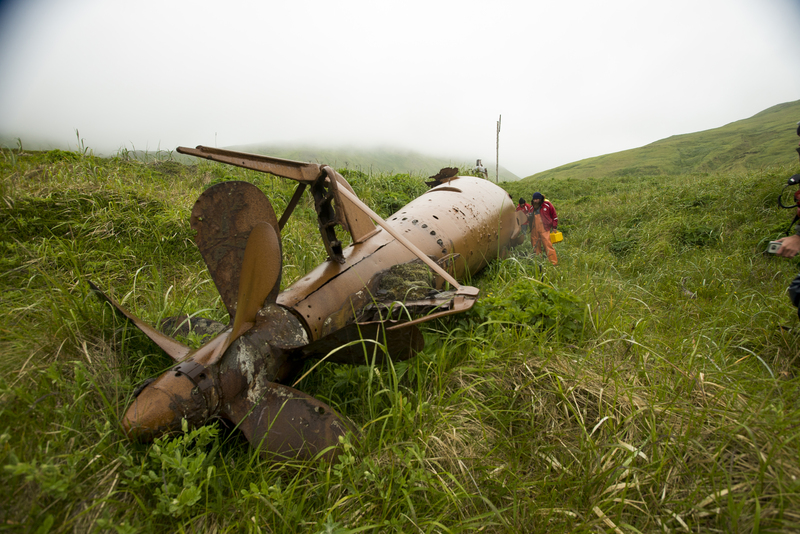 Members of the expedition take time to examine a Japanese mini submarine that remains in the historic sub pens on Kiska Island. 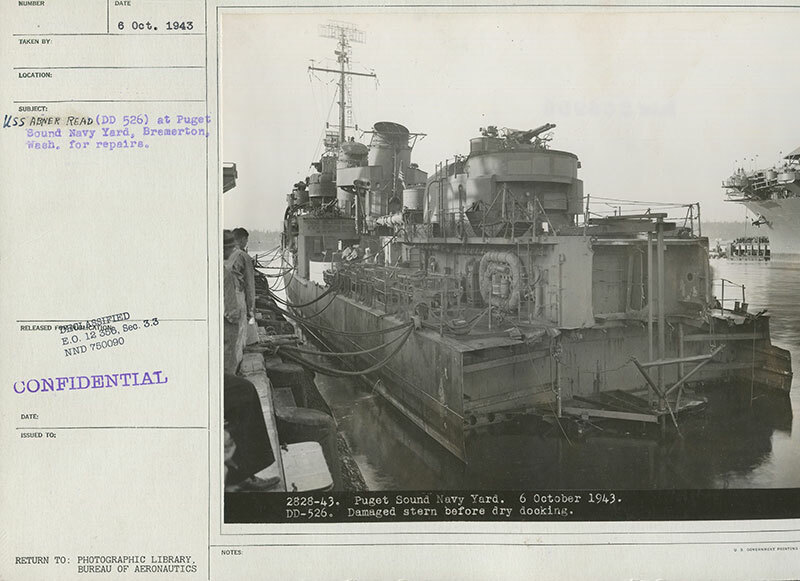 Image courtesy of the Kiska: Alaska's Underwater Battlefield expedition. Download larger version (jpg, 5.2 MB). The 17 hours of daylight that now occur at this high latitude were both a godsend and a curse as there was ample time to work, but little time to sleep. The majority of our search regions were on the eastern side of the island, protected from the strong westerly seas by Kiska Island, but somehow managing to allow enough wind to flow through the gaps of the windswept hills to keep the breeze strong in the coastal waters. The USS Abner Read was known to be located on the ‘upwind’ side of the island, so I kept my eye on the forecast for a lull in the winds to bring the vessel around to the search box we had identified. Historical image of the USS Abner Read. The red box indicates that section of the vessel that was blown off and sunk when the vessel struck a mine on August 18, 1943. Image courtesy of the U.S. Navy. Download larger version (jpg, 128 KB). The USS Abner Read was a 376-foot Fletcher-class U.S. Navy destroyer built by the Bethlehem Shipbuilding Corporation in San Francisco, California, and launched August 18, 1942, approximately nine months after the U.S. was forced to enter WWII. Between August 12-15, 1943, the ship shelled Kiska Island, providing fire support for the U.S. landing operations to retake control of the island from the Japanese. Once it became apparent that the fire support was not needed, the ship was reassigned to anti-submarine patrol off the west coast of Kiska Island. 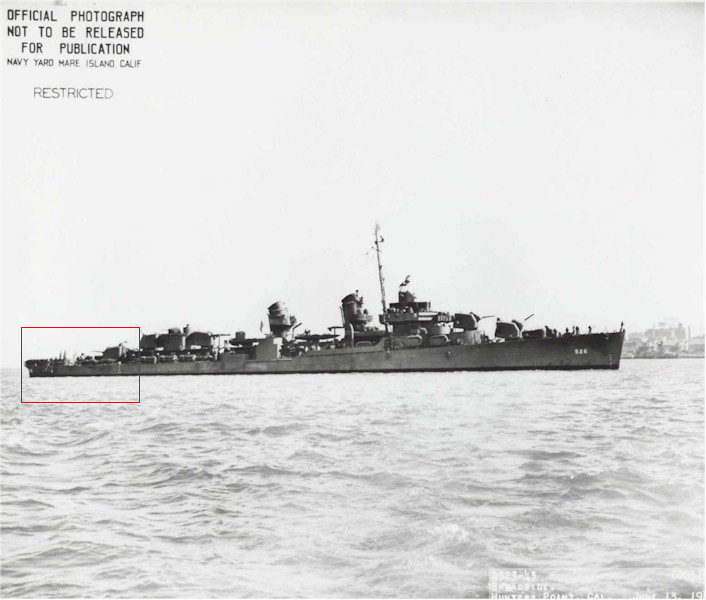 At 1:50 AM, on the morning of August 18, 1943, an explosion, presumed to be caused by a Japanese mine, resulted in a section of the ship's stern, approximately 75 feet in length, to break away from the vessel and sink. Swift action by the crew of the USS Abner Read preserved the ship’s watertight integrity and prevented the total loss of the ship. Rescue boats from the USS Abner Read, assisted by the USS Bancroft, pulled 20 men from the water. 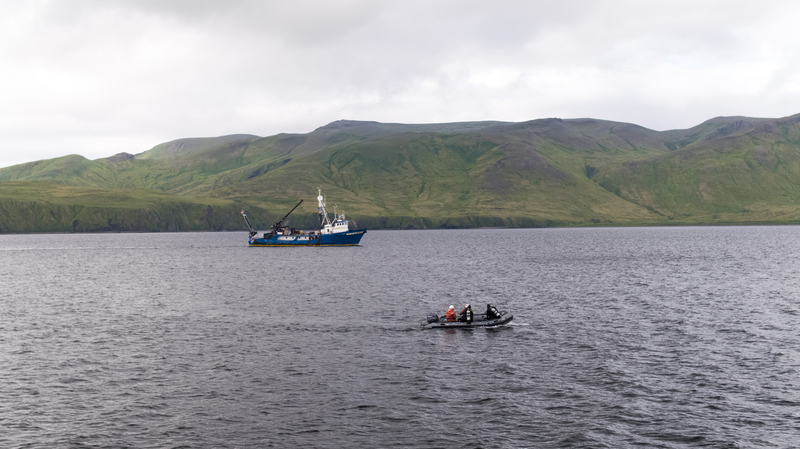 The USS Ute and USS Bancroft towed the stricken vessel to Adak for repairs. In total, 47 men were injured and 71 Sailors lost their lives, 70 of which are listed as Missing in Action as result of sinking with the aft section of the vessel, which included berthing/sleeping quarters. USS Abner Read undergoing repairs to the damaged stern on October 6, 1943, in the Puget Sound Navy Yard. Image courtesy of the National Archives and Records Administration. Download larger version (jpg, 5.8 MB). On the fifth day of our expedition, light winds from the southeast were expected to persist for a 36-hour window, providing the window we were looking for to reposition the Norseman II to conduct the search for the missing section of the USS Abner Read. Detailed logbooks from the ship documented the 6.5-kilometer submarine patrol lane they were instructed to follow and their use of an experimental navigation radar for measuring distances from geographic points of interest on the Island. The logbooks also indicated the location that they were put into tow, providing valuable clues for bounding the search box for where the encounter with the mine and the loss of the stern occurred. 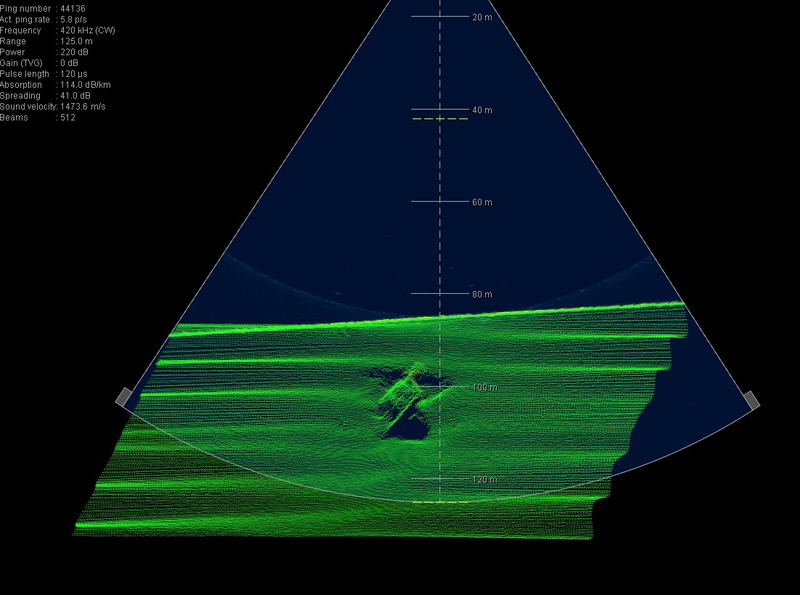 Multibeam sonar image of the stern section of the USS Abner Read. 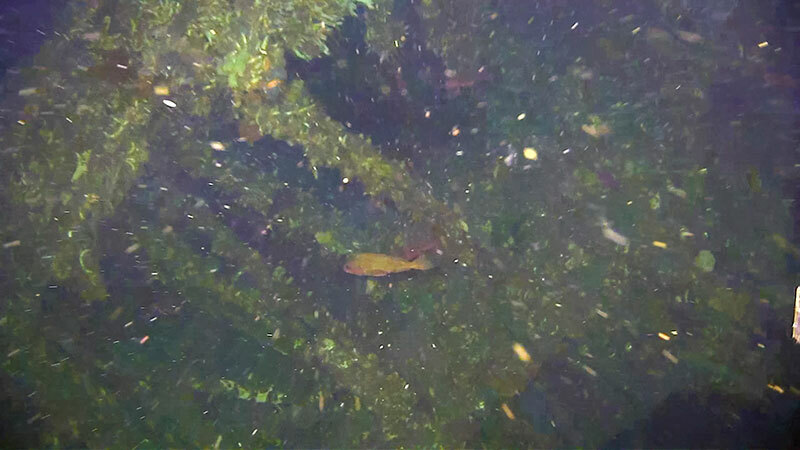 Image courtesy of Kiska: Alaska's Underwater Battlefield expedition. Download larger version (jpg, 399 KB). Due to the range of water depths in the area, our technology used for the Abner survey was a multibeam sonar that we mounted to the side of the vessel using a long steel pole. The sonar can hop across different acoustic frequencies, allowing us to optimize settings for a given water depth. Multibeam was chosen as it would allow us to ‘see’ to deep depths should the Abner be located at a depth beyond the 100-meter operating range of the four unmanned underwater vehicles brought on the expedition. The downside of multibeam is that the imaging resolution is coarse relative to the high-frequency sidescan sonar on our vehicle and provides primarily anomalies which must be further prosecuted for identification. However, we were optimistic that an approximately 75-foot section of missing ship, if still a single section, would be a clear signal in our sonar data. Arriving to the search area on a spectacular morning, one of the few that had glimpses of blue sky and a view of the cinder cone of Kiska Volcano, we established a set of survey tracks on the ship’s navigation computer and set about surveying the seabed. Driving in a ‘mow the lawn’ pattern perpendicular to the estimated drift track, we worked from the starting point of our survey to a few kilometers offshore, carefully looking at data from the 512 beams that comprise the sonar image. Battle damage schematic of the USS Abner Read overlaid on top of a sidescan sonar image of the wreckage of the USS Abner Read stern section collected during the expedition. 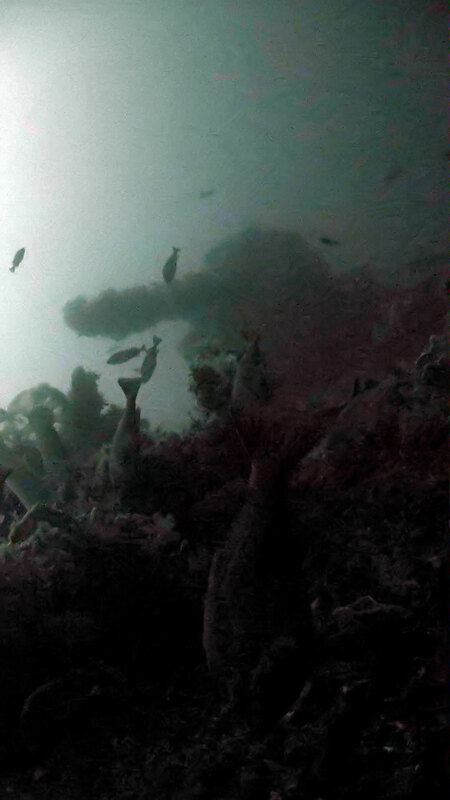 Image courtesy of Kiska: Alaska's Underwater Battlefield expedition. Download larger version (jpg, 188 KB). After exhausting an offshore search box in the first three hours of the search, the search was adjusted to move into shallower waters. On the second pass of the inshore leg, we found a sonar target that was assessed by our team to be that of the missing ship, with the high-frequency multibeam data clearly showing the aft section of a ship. On the following day, July 17, 2018, we used a combination of high-frequency sidescan sonar operated from our unmanned underwater vehicles to acoustically image the hull. While the water was too deep to anchor our vessel near the wreckage, the captain of the Norseman II was able to expertly hold station in the wind and waves for several hours while we lowered our remotely operated vehicle (ROV) so that we could capture high-definition video of the wreck site. 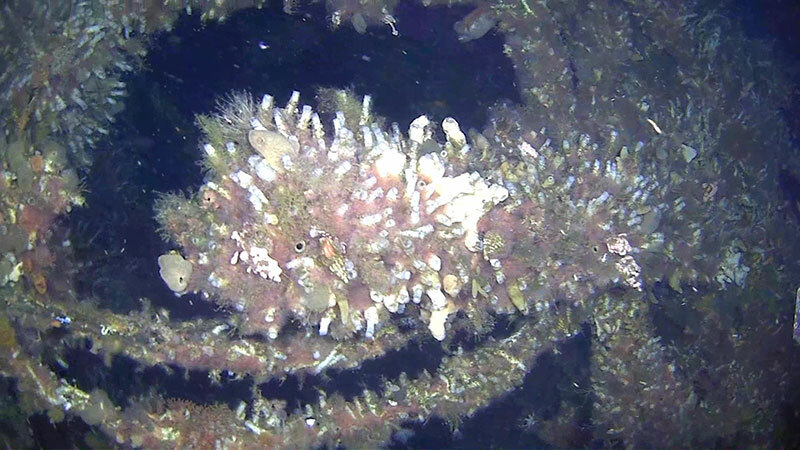 Wreckage of the USS Abner Read captured by the project’s remotely operated vehicle. 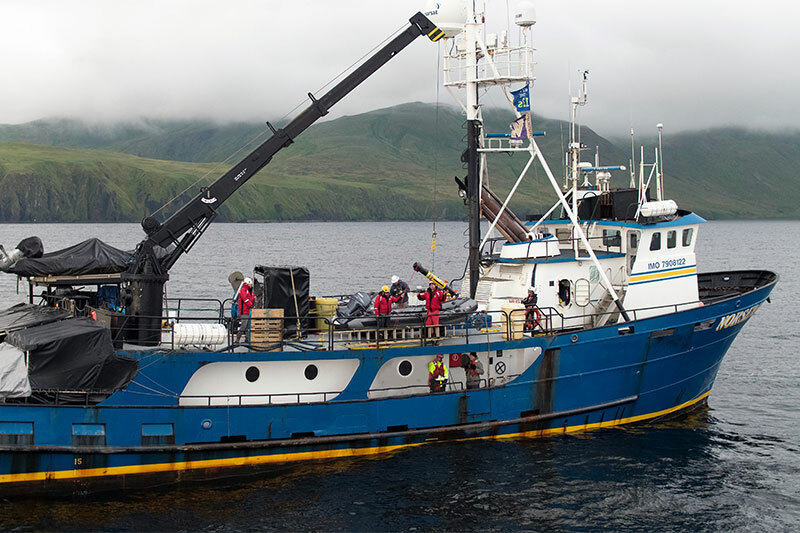 Image courtesy of Kiska: Alaska's Underwater Battlefield expedition. Download larger version (jpg, 698 KB). Looking inside the hull of the USS Abner Read stern. Image courtesy of Kiska: Alaska's Underwater Battlefield expedition. Download larger version (jpg, 764 KB). 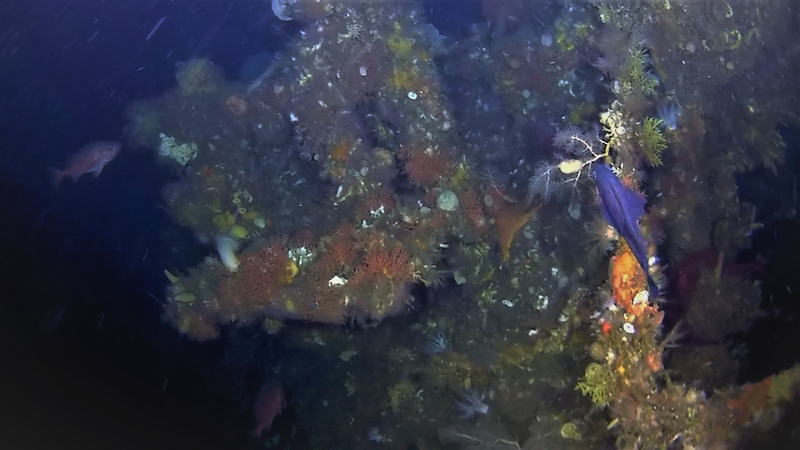 Wreckage of the USS Abner Read captured by the project’s ROV. Image courtesy of Kiska: Alaska's Underwater Battlefield expedition. Download map (jpg, 1.1 MB). Needless to say, it was a humbling experience for all onboard as the ROV glided alongside and above the wreck site, clearly imaging the broken stern section, stern gun, and rudder control of this watery gravesite for the Sailors who had been lost for close to 75 years. With the intention to honor and remember these heroes who lie at this site, we held a ceremony on the fantail of the Norseman II, placing a wreath of remembrance over the wreck site while Taps was played. Two active duty U.S. Navy divers sailing with us folded a U.S. flag in honor of those lost. The project team and members of the crew of the R/V Norseman II conduct a wreath ceremony to honor the final resting place of the 71 Sailors lost on the USS Abner Read. Image courtesy of Kiska: Alaska's Underwater Battlefield expedition. Download larger version (jpg, 2.4 MB). To this day, there are still more than 72,000 U.S. service members unaccounted for from World War II, leaving families with unanswered questions about their loved ones. The number 5 (aft deck) five-inch gun of the USS Abner Read imaged via the project’s remotely operated vehicle. Image courtesy of the Kiska: Alaska's Underwater Battlefield expedition. Download larger version (jpg, 671 KB).